On Mantis Radio this week we have a “techno takeover” courtesy of CONFOUNDED (DVNT & mrseavers), dropping heavy techno and bass cuts. CONFOUNDED are DVNT and mrseavers. You should know all me, DVNT, already. mrseavers was one of our first showcased artists back in 2007 on the 3rd show. He also came back and helped host the 4th show w/ EVAC up on the showcase. mrseavers cut his DJing teeth playing for Flatline at The Bomb in Nottingham. Slots at a variety of small clubs and bars in the area followed, both solo and as part of breaks duo Max Hedroom, graduating to sets at seminal breaks night Spectrum, London-based Ffaction, and the near-legendary “Max Hedroom presents” nights in the last few days of The Bomb’s existence – mixing up dubstep, tough electro and bowel-loosening hard techno to devastating effect with fellow cohorts Gareth Williams and Max Cooper. 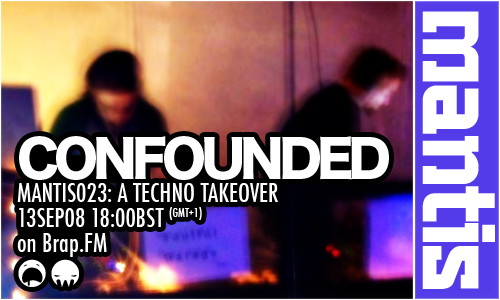 CONFOUNDED first performed in May in London and was a multi deck techno takeover. Dipping our fingers into the Mantis spec, Darkfloor electronica range too. An apology for the sound quality of some of the tunes. The setup we did for this show was using Traktor Scratch (as well as traditional vinyl), but it seemed not to respond very well to our decks.